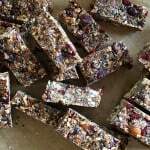 These no-bake granola bars are quick, easy, and endlessly adaptable. Some of you might have assumed, given the lengthy silence around these parts, that I’ve been busy having a baby. It’s a fair assumption, given my condition when we last spoke, but unfortunately not correct. Baby Muffin Myth is still baking away, much to the chagrin of Mama Muffin Myth (that’d be me). Don’t get me wrong, we’re still in good time (I’m just past 37 weeks now), but I am more than ready to evict this little creature who spends its days (and nights!) making its displeasure with its increasingly cramped living quarters known. I have had, for the most part, a fairly easy pregnancy. I’ve been fit and active and (other than the first trimester) eating well. I commuted to work on my bike right into the third trimester, stopping only when the roads became precariously icy. I’ve been swimming as regularly as possible, which feels AMAZING on my (heavy as f@ck) body, and I think I’ve done just about every prenatal yoga class in the YogaGlo archives. And, up until last Friday, I worked full time plus some extra bits on the side. Given all of this, I smugly thought I’d be one of those women who felt great right up until the very end. But no. Suddenly, the most mundane task requires supreme effort. I’ve legitimately had to lie down for a short nap half way through getting dressed for work. My back has gone out. Acid reflux has reared its ugly head. The wall of fatigue and aches and pains and general discomfort waiting for me at the end has caught me well and truly off guard, and I now feel quite done with being pregnant. Hopefully this little person inside of me is in alignment with an early, or at least (please, for the love of all things pure and good) on time arrival. What little energy I do have has gone into what they obnoxiously refer to as “nesting,” or what I call, “the necessary work required for fitting an extra human into our one-bedroom apartment.” I’ve gone KonMari on the place, but you’d never know it since all the extra space I created is now filled up with baby crap. Everything has been washed, folded, sorted, and put in its place. Our gold-plated stroller (we are carless folk, so we went for the best of the best) has been picked up and assembled. Baby shower thank-you cards have been written and sent out (though in an epic expat fail, I learned after the fact that I accidentally bought funeral thank-you cards – good thing I’m too tired to care! ), and our tiny Stockholm apartment freezer is filled to bursting with one-handed meals and snacks. Having said that, this pregnancy seems to be ending as it began: with a complete and total lack of interest in cooking. The meals we’ve been eating over the last month or so, unless they have been cereal, are credited solely to Paul. My dear husband is, by nature, not a patient man, and I must say he’s been doing a tremendous job of picking up the slack for his slow moving, grunty, and unpredictably emotional wife. The cooking I *have* been doing has been utilitarian of nature (must. fill. freezer.) and not what I consider to be sharable for this space (though many of the recipes do live in The Muffin Myth archives, so perhaps I’ll do a post about that if you’re interested) and the thought of lugging out my camera and hunching over my tremendous belly to take photos is just beyond what I’m capable of right now. There are plenty of food bloggers out there who manage to keep up their blog content through their entire pregnancies, and I truly do salute those ladies. But I am not one of them, and luckily, I am far too tired to care about that kind of thing. All of that is a long and awkward ramp up to a recipe I am going to share with you today, a recipe that is getting to you only by virtue of breaking essentially every rule of being a “good” food blogger. The photos were taken with my phone and are unedited. The ratio of words to pictures is totally unacceptable (though I promise to make it up to you with a bump shot if you get all the way to the end). The recipe was only tested one time. And the tweaks I made from the original recipe were made on the fly, based on what I had on hand, and not written down. That is to say, we’re going off of my somewhat shaky memory. You may, in fact, be better off simply following the original recipe instead of my version, but I’ll leave that up to you. I think that my pregnancy can be broken down not just into trimesters, but also into oat phases. Fairly close to the beginning when I arrived back in Stockholm still in the throes of food aversions but suddenly in the absence of the foods (read: bagels) that had been working for me on my vacation back in Canada, I reached for a warm and comforting bowl of oatmeal. Though it was summer and warm outside, those bowls of porridge really kept me going. I then transitioned into overnight oats as I began to find produce more palatable again, and was back at work and needing something quick and easy to transport with me. As the Swedish winter crept in and it became bracingly cold I switched back to a warm porridge, this time a multi-seed cereal mixed into a substantial oat base. And with end-of-pregnancy fatigue well and truly upon me, these days it’s quick and dirty bowls of homemade granola served with yoghurt and topped with whatever is within arms reach. 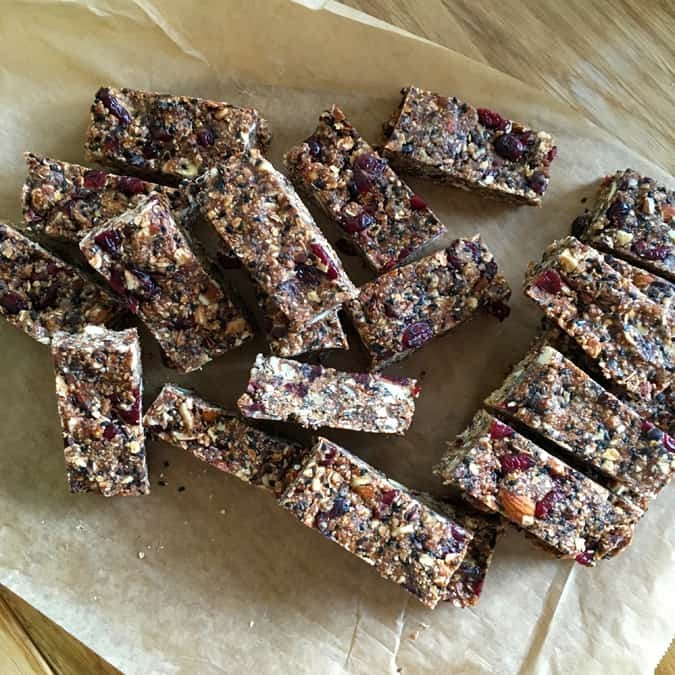 Now, staring down the infamous “fourth trimester” and frantically filling my freezer, it’s a mix of breakfast bars and these quick and easy no-bake granola / energy bars which I envision will be my one-handed champion of breastfeeding snacks. So let’s talk about these bars. They’re delicious as they are humble, and as easy as they are impressive. You need only turn on your oven if you choose to toast the oats, nuts, and seeds (I did, and felt it was worth it, but feel completely free to skip this step). They’re easily vegan depending on the type of liquid sweetener you choose (maple syrup, honey, date syrup, agave, and brown rice syrup are all good options) and the nut butter component is also a choose your own adventure situation. I opted for cashew butter because I had a past-its-prime jar on hand, but peanut, almond, or sunflower seed butters would all be fine as well. For the mix-ins I chose a variety of things in my cupboard that needed using: black sesame seeds, cocoa nibs, dried cranberries, and chopped almonds, but of course, you can toss in anything you want or choose to be starkly minimalist as well. Also, in a move that is decidedly un-Muffin Myth, in my tweaks from the original recipe I ended up doubling the liquid (nut butter and sweetener) component. To be completely honest, I wasn’t feeling mentally strong enough to wrestle with crumbly granola bars, so when the mixture didn’t come together just so, I just went for it. But to justify my actions on a nutritional basis, I also intended for these to be energy dense (breast feeding mammas need an extra 500 calories per day) so had no reservations in doing so. And I cut them into pretty small bars in the end. But you may want to consider halving both the nut butter and liquid sweetener if you’re looking for a leaner bar. Oats, yo! Oats are rich in indigestible carbohydrates called beta-glutens which help to lower blood cholesterol levels. Oats are also host to a number of phenolic compounds which have antioxidant properties. Due to the high levels of those beta-glucans, oats are also helpful in stabilizing blood sugar. In fact, eating oats in the morning may help keep your blood sugar stable throughout the entire day. Oats are also a good source of dietary fiber and protein. Look for gluten-free oats if you’re celiac or have another gluten sensitivity. Line the bottom of an 9 x 11-inch pan with parchment paper. Preheat the oven to 180ºC / 350°F. Roughly chop the almonds (I did this by pulsing them in my food processor), then mix with the oats and sesame seeds and spread out on a baking sheet. Toast for 10 to 12 minutes, stirring once or twice while baking, until they are slightly browned. Transfer into a large bowl. Finely chop the dates (I also did this in the food processor, and pulsed them until they formed nearly a paste). Add the dates, cocoa nibs, and cranberries to the bowl. Heat the nut butter, sweetener, and salt in a small saucepan, stirring until warm and fluid, but not boiling. Pour the liquid over the oat mixture in the bowl and stir until it’s completely incorporated. I found that getting in there with clean hands was the path of least resistance. Transfer the mixture to the prepared pan and pat it down so it’s as flat as possible - clean, wet hands do the trick here. Refrigerate the granola bars for at least 30 minutes. Remove the pan from the fridge and pull up on the edges of the parchment paper to release it from the pan. Carefully slice the bars into rectangles - I cut about 24 small bars from mine. Store the granola bars in the refrigerator, or for a longer time in the freezer (this is where mine are at). Impressive bump shot! I’m so happy to read this and know that despite the justifiable grumbles you are fit and well. I think I told you previously that I had my Rachel (now almost 20!) very early so never got to see an impressive bump. Enjoy the relative calm and teo-handed eating while it lasts. I enjoyed your honesty and humour writing up the recipe. It would be great if course with or without the breastfeeding calories. Keep well. Keep sane! Thanks Kellie! I think that humour is the only way to get through these days of late pregnancy. Humour, and swimming! LMAO right now! I love this post. It brings back so many fond memories. You’re handling this pregnancy so well. Look at you! You look amazing! Hang in there, soon you’ll be wondering why you were in such a hurry to get that little sweetie out of your belly. Because, no sleep. The bars look and sound great! Hi Katie: As always, thanks for your amazing recipes, always sooooo good. We, here on Soames Point are waiting in patiently, others like me, can’t wait!! We are all very excited. My goal is to be completely sugar-free this year, and so far so good. I was thrilled to find your banana date muffin recipe. I’m wondering about date syrup. I am not using honey or maple syrup, would date syrup be the same or could I sneak a bit in? And yes, those last days feel like years. But it will end! Hi Leesa! This really depends on what your sugar-free paradigm includes. Dates are naturally loaded with sugar – they’re about 75% carbohydrate, 90% of which is sugar in the form of glucose and fructose. So while date syrup is typically just cooked down dates and water, it is absolutely sugar, as are the dates themselves. You have to decide what feels right for you and fits into your definition of sugar-free! They look so good I’m afraid to make them. I know the quantity of nut butter and honey can be fluid but are they equal amounts. Your gravid brain just said 1 nut butter. Don’t you look just adorable!!! You are right at the finish line. I remember stopping work about a week before my first (cousin Michael) was born. It was absolutely the most delicious time…much time with my feet up on the bed reading. Then the awakening!!!! Forty years ago. 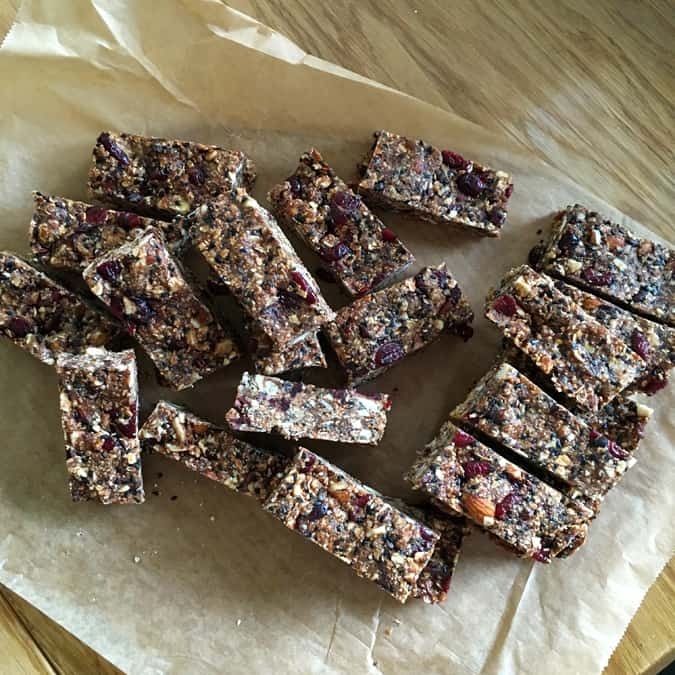 Bars look delicious – definitely trying them! 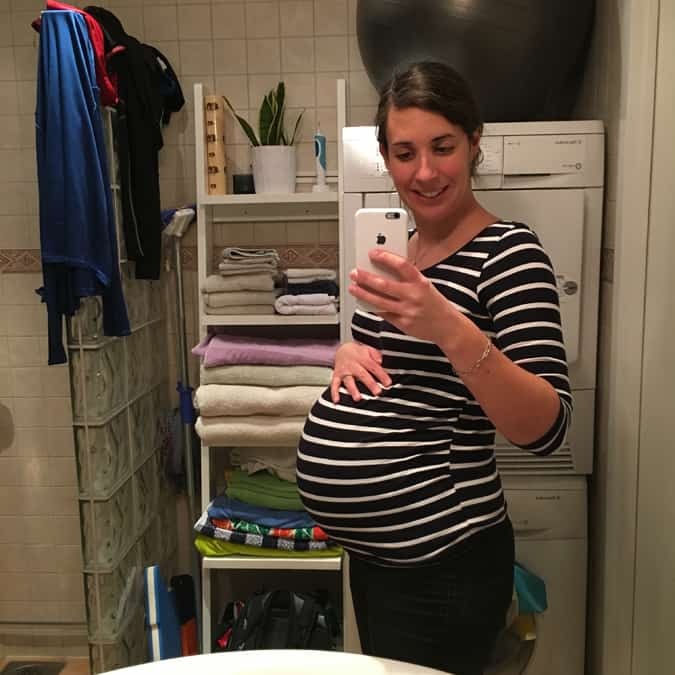 I’m in the same preggo boat as you – due 2/22 – have been feeling totally fine and the last 2 days – so uncomfortable! Hang in there – almost done!